Our 21st Red Cedar Writing Project Invitational Summer Institute, is composed of 6 outstanding secondary teachers of writing, RCWP Co-director Dawn Reed, and myself. I am humbled daily by the amazing insights each participant offers as together we attempt to improve our practice as writers, as teachers of writing, and as teacher leaders. In lieu of an individual log report, I am inviting each of our participants to join me in commenting on the most important thing they feel they learned today. I'll add my own insights at the end. This has been a day, like most, punctuated by food--literal and figurative. We began with an amazing homemade bread and fruit bowl (watermelon, strawberries and blueberries! YUM!) that Kristen made for us. Lunch was a collaboratively developed salad bar. Salad greens, cheeses, fresh vegetables, fresh fruits, and a variety of salad dressings were complimented by animal crackers; a whipped cream, chopped apple and candybar fluff; and chocolate chip cookies. All afternoon we were able to graze on these leftovers and the miniature candy bars that Mitch, who is facilitating WIDE PATHS: Digital Writing Workshop, shared first thing in the morning. But we have fed one another figuratively as well. From short consultations on pieces of writing and teaching demonstrations to check-in's on portfolio progress, we were busy, busy campers. We looked at children's books and their ability to break complex aspects of grammar, syntax and usage down to manageable chunks for our students. We adopted a critical stance on language usage, and talked about colleagues whose life work has been devoted to trying to make school a more equitable, accessible place for students often marginalized. We applauded Mandy's film trailer and film review log report that once again, pushed the log genre envelope, and we discussed the cookbook that hasn't yet materialized though it remains on our minds (usually accompanied by stomach growls). My son, Aaron, and I were an extension of the RCWP Writing Marathon today. 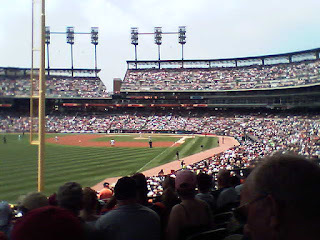 While it's true we actually went to see the Tigers play the St. Louis Cardinals, I began my day with every intention of joining a group in East Lansing for the actual Writing Marathon. Even before Mitch began the marathon with a couple prompts, he mentioned in an off-hand way that he had Tiger tickets for today's game in his pocket --- and they were going to go unused. I may have pretended to write the prompts, but all I could think about was whether or not I should pounce on those tickets like a team of tigers. So, at 10:45, I called Aaron and we decided to go. 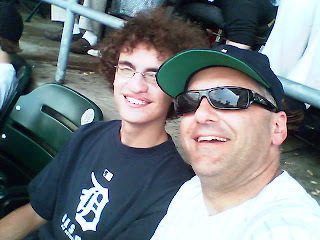 We scurried to Detroit for the 1:00 game. He even drove part of the way so I could do some writing. While it's true we missed the first half of the first inning, as we walked into the stadium, Curtis Granderson, #28, was introduced as the first Tiger batter; this was somewhat kismetty (is that a word?) since I wear #28 on the church softball team --- I took it as an omen of good things to come. I skipped one fun moment. As we approached the stadium, we passed a saxophone player tooting out the rhythm to the Addams Family TV show. Just then, a bus with about 40 kids in it pulled up to the stop light in front of the sax player. Without skipping a beat, as if they had planned it all day, the kids joined in on the song. They clapped in the right spot over and over again...da-da-da-Da, clap-clap, da-da-da-Da, clap-clap, da-da-da-Da, da-da-da-Da, da-da-da-Da, clap-clap! They were all smiles and it made us get into the mood too. The game zoomed into the 5th inning. No runs, lots of hits, and fortunately plenty of shade & breeze (see the photo, above)...thank you, Mitch. The chili cheese fries --- a tradition with Aaron and me --- smelled like baseball, tasted like heaven, and disappeared entirely too fast. By the bottom of the ninth inning, we were down 2 to 1 and it looked like the afternoon would end about the same time the sun was catching up with our seats. Then, Gary Sheffield clobbered a home run out to left field, only 20 yards away from us. Our defense & pitching held in the 10th inning and Curtis Granderson started the rally in our half of the inning (that's the sort of thing that goes unnoticed by the media, but us #28s stick together). A couple intentional walks later and Clete Thomas earned a walk with the bases loaded --- giving us the victory. Forty one thousand twenty two fans were overjoyed! Actually, I bet there were about 200 Cardinal fans in the ballpark who were on the grumpy, pissed off side of the street. Assorted observations: people do many other things while the game is being played including reading the Detroit News and texting each other like fiends; this one little kid didn't seem to care that his dad spilled beer on his cap; I bet 300 people stood and watched the whole game leaning on one rail or another; not only is people-watching fun, but watching people people-watch can be very entertaining; sometimes it seems like players want to get thrown out of the game (Polanco reminded me of Rasheed Wallace today...firing up the team with his unnecessary, but entertaining, antics). Part of the fun for me is avoiding the traffic jams leaving the game. Adding to the challenge was that the game ended right before rush-hour traffic began. Suffice it to say that with Aaron as my navigator, we used the side streets well and skirted around most of the long lines. In essence, we won, again. The chili cheese fries were long gone by this time and we were happier because of it. P.S. Curtis scored the winning run and extended his hitting streak to 14 games. Go #28! Well, I have finally been able to take some time to work up the podcast from the NWP Annual Meeting that I started a few weeks ago. This conversation took place in the context of the Tech Initiative meeting on Saturday morning and, like all NWP conversations, helped me think about our work and how we might refine it in the new year. More notes from the session can be found on our wiki. Two points to consider as you listen to the conversation. First, Inverness Research Associates did a nice job of framing the conversation around four dimensions and seven propositions, which I list below. Second, this was a conversation held in the larger context of a full-morning meeting, and in the even larger context of the last three years of the NWP's Technology Initiative. So, as you listen, know that this group has been thinking about these issues for a long time. For us at RCWP, it gives us lots to think about in terms of where we want our work to go next. For other sites that may not have started with tech work yet, it can be overwhelming to think about all these issues, so don't let this list get you down. Instead, use it to guide your thinking about where you are and where you want to be in terms of technology and literacy. NOTE: The items below come directly from handouts provided by Inverness Research Associates. The powers of technology exist alongside challenges and vulnerabilities. The world of technological innovation moves at a different pace than the educational system. Technology is integral to the discipline of writing today and is here to stay. Knowledge of the discipline (writing) is essential for wise use of technology to teach in the discipline. Technology amplifies aspects of teaching and learning writing (e.g., audience, voice, equity and access, publication, collaboration). Technology challenges assumptions and approaches to assessment of writing. New language associated with the use of technology to teach writing is emerging. 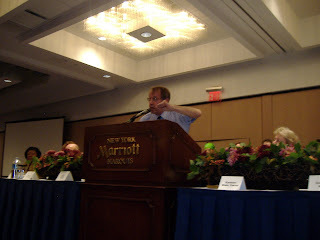 The NWP and NCTE conference in NYC was one of the best conferences I have ever attended. It was a highlight of my year and the recharge that I needed. From meeting and conversing with old and new friends to collaboration on important aspects of our work as teachers this conference inspired me. As I reflect upon the wealth of ideas shared in NYC, I noticed that tonight the tree was lit at Rockefeller Center in NYC. It’s hard to believe that just two weeks ago (where did the time go?) the scaffolds were surrounding this huge tree in preparation for the holiday lights. This year the tree reminds me to dream big and start small. I never imagine d the shear mass of the tree before standing at the base of it with RCWP friends. I realize that sometimes teaching can be like that big tree. You can take the metaphor in different ways, but quite simply, I can’t imagine decorating that tree. I can however, imagine that to work on it you’d have to work one bulb at a time. So, just as there are many aspects to our work as teachers, we can address them one step, conversation, student, at a time. We dream big and imagine that beautifully lit tree, but start small, one bulb at a time. From great sessions on digital writing, preparing for testing, starting a writing center, to reading policy, etc. (for details to sessions visit the RCWP wiki) we also had a great opportunity to learn and reflect on ideas with others at the NWP social. Meeting up with RCWP TCs was great. 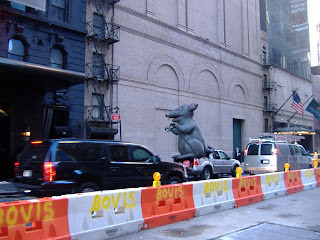 We walked by “The Late Show” to rodents of unusual size and Broadway show workers who were on strike, all on the way to our fabulous soup dinner. Yum. I loved NWP and NYC. I was however, surprised that despite the advertising overload of Times Square, which makes the city feel like a constant buzz, I actually found it a bit difficult to gain internet access without paying quite a bit. So, if anyone knows the wi-fi tips for big cities, I am in need of some good tips. After reading and discussing several provocative books this year, the RCWP Book Club is looking for book suggestions for our 2008-09 season. We're interested in everybody's recommendations and hope to maximize our input by utilizing this blog. Whether it's a book you've been wanting to read, a book you have read and would like to discuss, or a book you recently encountered in the latest catalog, we want to know about it! Please add your recommendations by simply clicking on the "Comments" link below. Like the Rodents of unusual size, this lovely lady surprised a few of us at Brazil, Brazil. She was showing the proper way to flush (in Brazil, I guess). In case you can't see Step 4, it says "Praise each toe for a job well done. Call the big toe, Chubs." I have no explanation for this. Pure silliness, I'd say. "Rodents of unusual size? I don't think they exist..."
Enjoy our podcast from La Bonne Soupe in New York City! I would hate to be confused with those of you who habitually stalk innocent authors and activists or whatever, but I was able to find a front row seat at this event Thursday evening in front of Jonathan Kozol's name plate...and snuck a picture before security dragged me away kicking and screaming... Okay, I made that last part up. And that's Kathleen Blake Yancey hiding behind those flowers too. I also came away from the convention with an autographed copy of Letters to a Young Teacher. To date, the highlights of my own quiet protest to NCLB mandates have been to encourage a seasoned teacher, who was informed that after 30-some years in the classroom that he was not highly qualified, that he really ought to chain himself to his desk or something. "Come on, man," I told him, "You're from the sixties. All us young(er) teachers need some role models." Well, he didn't do it, as I'm sure you've noticed because you would have seen it in the news, but I still held out hope until the whole thing was worked out pretty much peacefully (if you consider the demoralizing of a master teacher peaceful). Anyway, the speech was as incredible as anyone who's ever read any of Jonathan Kozol's work might imagine. Thanks for the ticket, Liz!!!! A Writing Prompt (or two) for You!